Find device-specific support and online tools for your Samsung Galaxy Tab E (8.0). Get to know your new Samsung Galaxy Tab E (8.0) with this quick reference guide. 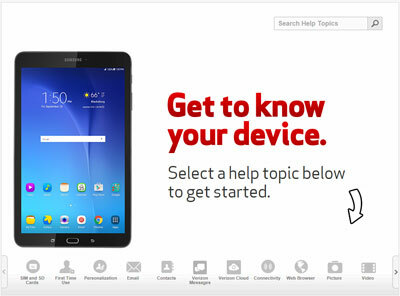 Learn how to get around your Samsung Galaxy Tab E (8.0) from Verizon. Save battery life by changing the settings on your Samsung Galaxy Tab E (8.0) from Verizon. Learn how to pair your tablet to a Bluetooth device on your Samsung Galaxy Tab E (8.0) from Verizon. Learn how to pair your Samsung Galaxy Tab E with your Bluetooth device. Learn new ways to take pictures and videos on your Samsung Galaxy Tab E (8.0) from Verizon. A visual guide to sharing a video on your Samsung Galaxy Tab E.
Learn how to take a picture using your Samsung Galaxy Tab E.
Learn how to zoom in and out for video on your Samsung Galaxy Tab E.
Personalize the home screen on your Samsung Galaxy Tab E (8.0) from Verizon. Browse the web on the go using Google Chrome on your Samsung Galaxy Tab E (8.0) from Verizon. An interactive guide for changing the language settings on your Samsung Galaxy Tab E.
A visual guide for replying to an email on your Samsung Galaxy Tab E.
A step-by-step visual guide for sending an email using your Samsung Galaxy Tab E.
Add security and customize the lock screen on your Samsung Galaxy Tab E (8.0) from Verizon. A visual guide for saving energy on your Samsung Galaxy Tab E by adjusting the screen timeout. Discover how to access and clear the Notification Panel of your Samsung Galaxy Tab E.
Discover how to attach a video to a text message from your Samsung Galaxy Tab E.
See how to use two apps at the same time with Split Screen on your Samsung Galaxy Tab E (8.0) from Verizon. Learn how to connect your tablet to Wi-Fi on your Samsung Galaxy Tab E (8.0) from Verizon. Automatically connect to Wi-Fi with the enhanced Wi-Fi connectivity feature on your Samsung Galaxy Tab E (8.0) from Verizon.